Start using our CLOUD system immediately, or set up in your OFFICE. Pay for users with no limitations on Rooms or Bookings. Make sure you don't get charged more when you get busy! Rooms and Bookings are UNLIMITED. From £15 per Month for multiple users. 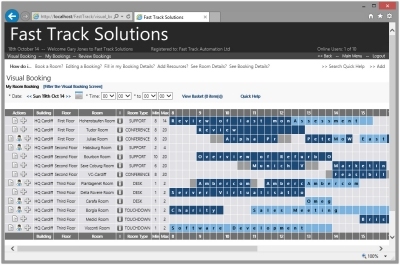 Full Room/Desk/Space Booking functionality and highly-scalable. 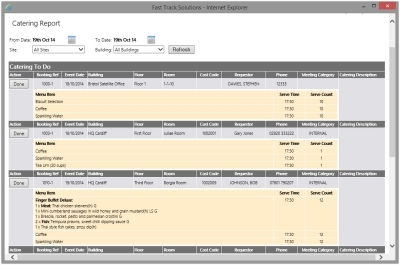 Fast Track Room Booking is available to staff and customers anywhere. Fully permission controlled, it will save your staff time, by automating meetings, conferences, hot-desks, catering, A/V equipment, visitors and more. CLICK HERE to request FREE DEMO/WEBINAR Details, and let us know any Questions you have. Fast Track Room Booking has a low start-up cost, and contains the everyday and advanced mechanisms needed to automate all booking processes. The Cloud Room Booking System will inexpensively provide Self-Service enquiry or booking access for your staff and customers (as you allow), increase your room utilisation % and reduce your costs.